Disruptive innovation in the late 90s. Like any good design student who imagined immersing herself in the shiny new product development world, I lapped the phrases up. Jobs to be done (JTBD). Milkshake marketing. We want quarter inch holes, not quarter inch drills. Got it. Pairs nicely with design ethnography and insightful observations waiting to be plucked from plain sight. What happens when designers spout HBR concepts to tech executives is a story for another day. But the notion of looking for those small missed opportunities still reigns on. It guides my work–both consulting and teaching–and those familiar JTBD anecdotes have often helped me connect to skeptical audiences too. Undoubtedly many of those who transit to the land of user experience design hail from other worlds. And so many of us in creative fields continually evolve and morph, blurring the lines, never content to settle for just one thing. It bewilders strangers, baffles friends and sends our mothers into a frenzy (just ask mine). Despite my dalliances in constant reinvention, I never thought of these personal acts as “disruptive” in the Clayton Christensen sense. Truth be told, I only thought about my own disrupting is mostly an ambivalent way: my often inconvenient personal aversion to inertia. 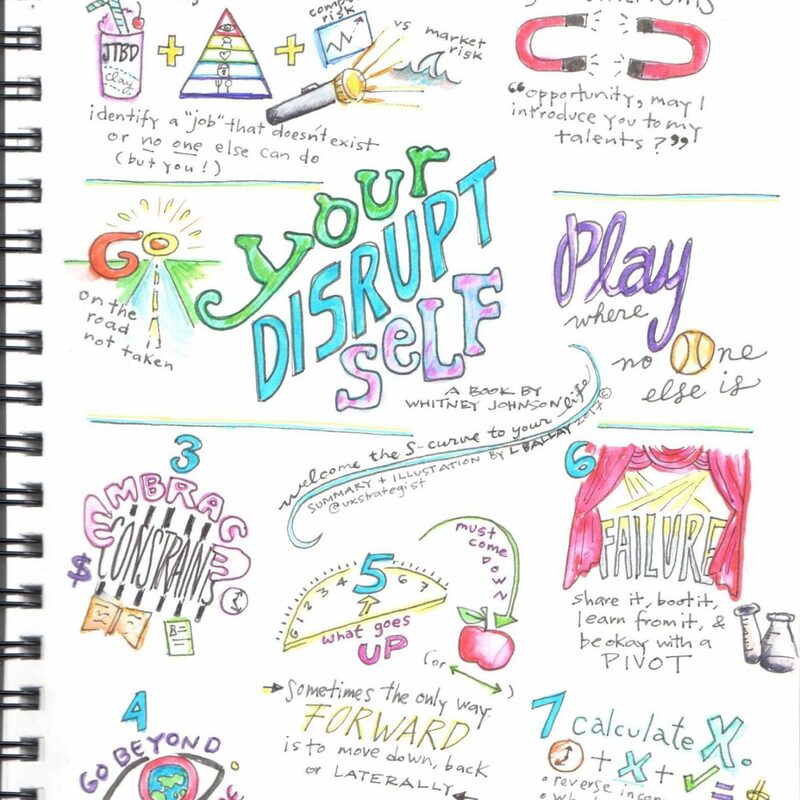 So when many moons ago, I saw that Whitney Johnson was looking for a few volunteers to review her new book Disrupt Yourself, I was curious and put my hand up (virtually, that is). And a copy with a lovely note from Whitney quickly made its way to me. It’s not that I didn’t read it soon after receiving it–I did. It’s that I wasn’t sure what to do with it. At a 127 pages, it’s a quick read of straightforward advice and lots of war stories. But after years of “personal disrupting” its contents seemed all too familiar. So what could I possibly say other than, Hello, old friend. So it curled up on my bureau, dozing for awhile while I went about my life with my tiny bursts of disruption (and interruption). 1. Reframing and Empathy: I needed to see this book from another person’s perspective. Personal reinvention, and abandoning the tried and true, is terra incognita for many. I would imagine that you might want this book in hand before thinking about taking a big leap. Linking our personal development (or careers/calling) to product development makes sense. It recasts what might be brushed off as wishful daydreaming into something with the gravitas of strategy. The anecdotes sprinkled throughout are like friends who cheer you on. Think of it not as a “How To,” complete with checklists and worksheets, but rather a “Getting Started” that then spurs you on to create a plan toward making it all more concrete. 2. Positive Affirmation: Translating Whitney’s words to a sketch allowed me to see and retell my own activities and stories with a glow of positivity. 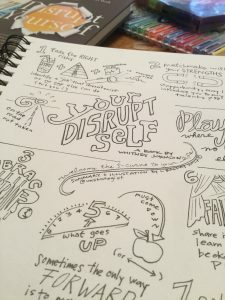 Sure, I knew those risks, lateral moves and setbacks are part of the learning experience, but I can now think of them as following a playbook–that it was intentional and following a process. And when we see our messy familiar in structured, reasoned print, it provides legitimacy. As I placed the cap back on my trusty pen after my sketchnotes, I thought to myself that maybe there has been a method to my madness all along. 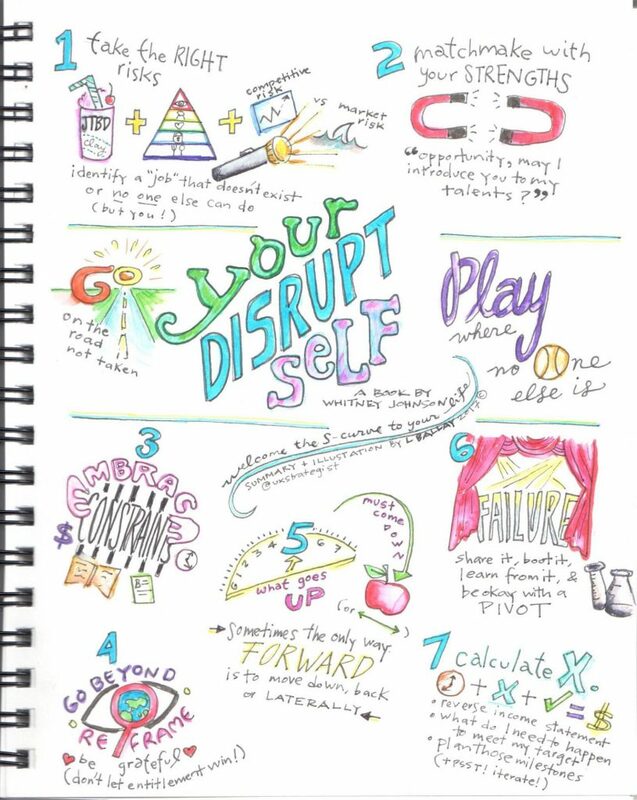 Key Concepts in mind map extracted from Disrupt Yourself by Whitney Johnson.